No one deserves cancer- if it is preventable. Let's confine cervical cancer to medical history. Since our launch, we have identified a significant number of women with high grade pre cancer lesion on their cervix, offering treatment. These women, who otherwise would never have a pap smear done on their lives, would have their lesions progress into cancer in 5-10 years. Our organisation has helped prevent cancer in these women's lives, enhancing their quality of life personally, and as part of a family and community. Let's be clear, over 85% of these deaths occur in the women living in the developing world. This is a rights issue. We know more about cervical cancer, more than almost any other cancer in the world. We know how to prevent HPV with a simple, effective vaccine. We know how to screen women with an affordable and easily available solution. This is one of the first cancers, ever- for which elimination is entirely within our reach. We can stop cervical cancer for EVERY woman, who is left undiagnosed and untreated for too long. The time is NOW to stop cervical cancer. 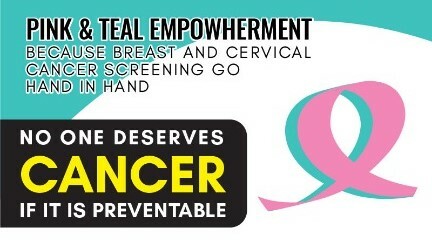 So we, at PInk & Teal EmpowHer: GO, screen and cure. Pink & Teal EmpowHer is a non-government charity organization, which aspires to increase awareness and screen women for breast and cervical cancer irrespective of race, religion, cultures and boundary. We aim to provide screening with utmost compassion, professionalism and care. "Cervical cancer is the second most common cancer, in terms of incidence and mortality, of all ages in Malaysian women. This high burden of disease is a major public health problem that could be prevented by effective primary and secondary prevention strategies in conjunction with appropriate diagnostic and therapeutic case management. Although the Pap smear programme has been in effect for 3-40 years, a reduction in incidence and mortality comparable to that recorded in developed countries has not been achieved in Sarawak. The national cytology programme does not meet the quality indicators, e.g. adequate coverage and reliable follow-up. VIA consists of inspecting the cervix with the naked eye, using a bright light source, after applying 3-5% solution of acetic acid. Allows the provider to make an immediate assessment of a positive (abnormal) or negative (normal) test. We provide clinical specialist consultation to the rural women in Sarawak who are otherwise disenfranchised."